Jessica DuLong, the world&apos;s only female engineer on a fireboat, will be the first speaker at the 2011 Maritime Author Series at Mystic Seaport, which starts Jan. 26. DuLong will discuss "My River Chronicles: Rediscovering the Work that Built America; A Personal and Historical Journey," a memoir that details her career change from freelance journalist and dot-com executive to becoming the world&apos;s only female diesel engine operator aboard a fireboat. In her book, DuLong describes first volunteering aboard the antique fireboat John J. Harvey, then leaving her career for a job in the vessel&apos;s engine room and a life along the ever-changing Hudson River - a transition that caused her to question what America was losing in its shift away from hands-on work. These questions crystallized for DuLong in the aftermath of the Sept. 11, 2001 terrorist attacks when the retired John J. Harvey was called back into service and its crew pumped water to fight blazes at Ground Zero. The series runs Wednesday evenings Jan. 26, March 2, March 23 and April 27 from 5:30-7:30 p.m. in the museum&apos;s G.W. Blunt White Building. Tickets are $65 ($50 for members) for the series and $20 ($15 for members) for individual programs. A wine and cheese reception will be hosted at 5:30 p.m., followed by the author&apos;s presentation at 6 p.m. and then a question-and-answer session. One attendee at each program will also win a free copy of the author&apos;s book. 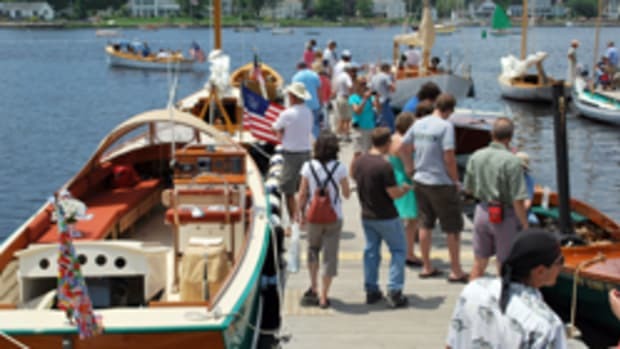 Tickets are available online at www.mysticseaport.org/tickets or by calling (860) 572-5322. March 2: David Fisichella, an engineer who manages Shipboard Scientific Services at Woods Hole Oceanographic Institution, will discuss "Seven-Tenths: Love, Piracy, and Science at Sea," a memoir that details his maritime adventures with his legally blind oceanographer wife, Amy. March 23: Roy R. Manstan and Frederic J. Frese will discuss "Turtle: David Bushnell&apos;s Revolutionary Vessel,"their historical account of the first operational submarine designed to sink the British Fleet during the American Revolution. April 27: Eric J. Dolin, author of "Leviathan," returns to Mystic Seaport to discuss his latest book, "Fur, Fortune and Empire,"an account ofthedevelopment and impact of a fashion-driven fur trade from its inception in the early 17th century to the late 1880s.